Movement of any of the three primary flight control surfaces (ailerons, elevator or stabilator, or rudder), changes the airflow and pressure distribution over and around the airfoil. 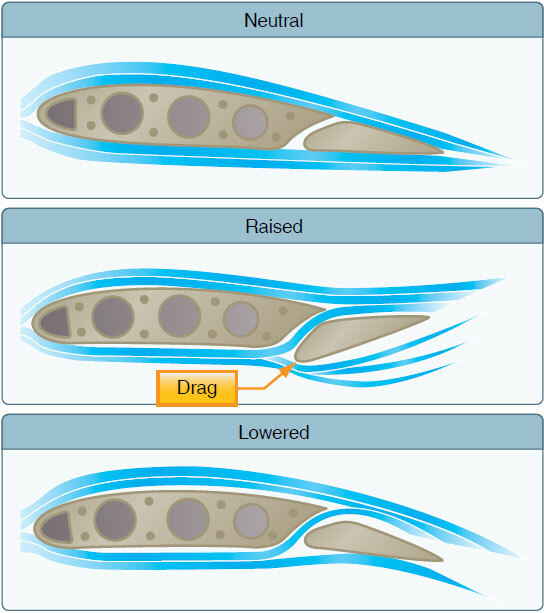 These changes affect the lift and drag produced by the airfoil/ control surface combination, and allow a pilot to control the aircraft about its three axes of rotation. Design features limit the amount of deflection of flight control surfaces. For example, control-stop mechanisms may be incorporated into the flight control linkages, or movement of the control column and/or rudder pedals may be limited. The purpose of these design limits is to prevent the pilot from inadvertently overcontrolling and overstressing the aircraft during normal maneuvers. Figure 6-4. Airplane controls, movement, axes of rotation, and type of stability. 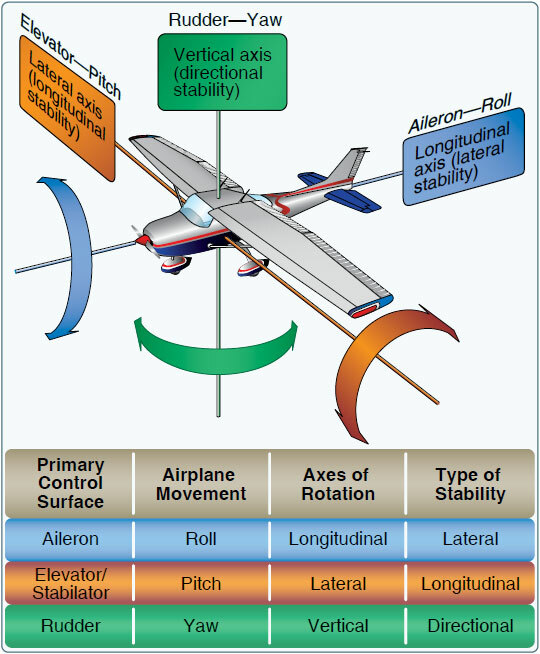 Ailerons control roll about the longitudinal axis. The ailerons are attached to the outboard trailing edge of each wing and move in the opposite direction from each other. Ailerons are connected by cables, bellcranks, pulleys, and/or push-pull tubes to a control wheel or control stick. Moving the control wheel, or control stick, to the right causes the right aileron to deflect upward and the left aileron to deflect downward. The upward deflection of the right aileron decreases the camber resulting in decreased lift on the right wing. The corresponding downward deflection of the left aileron increases the camber resulting in increased lift on the left wing. Thus, the increased lift on the left wing and the decreased lift on the right wing causes the aircraft to roll to the right. Figure 6-5. 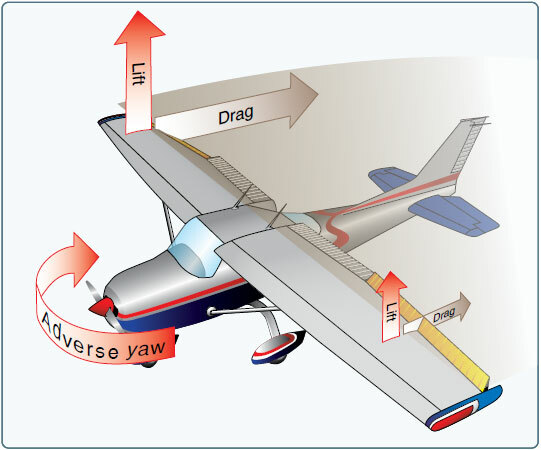 Adverse yaw is caused by higher drag on the outside wing that is producing more lift. Adverse yaw becomes more pronounced at low airspeeds. At these slower airspeeds, aerodynamic pressure on control surfaces are low, and larger control inputs are required to effectively maneuver the aircraft. 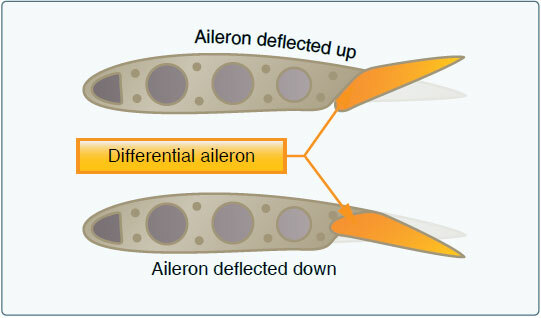 As a result, the increase in aileron deflection causes an increase in adverse yaw. The yaw is especially evident in aircraft with long wing spans. Application of the rudder is used to counteract adverse yaw. The amount of rudder control required is greatest at low airspeeds, high angles of attack, and with large aileron deflections. Like all control surfaces at lower airspeeds, the vertical stabilizer/rudder becomes less effective and magnifies the control problems associated with adverse yaw. All turns are coordinated by use of ailerons, rudder, and elevator. Applying aileron pressure is necessary to place the aircraft in the desired angle of bank, while simultaneous application of rudder pressure is necessary to counteract the resultant adverse yaw. Additionally, because more lift is required during a turn than during straight-and-level flight, the angle of attack (AOA) must be increased by applying elevator back pressure. The steeper the turn, the more elevator back pressure that is needed. As the desired angle of bank is established, aileron and rudder pressures should be relaxed. This stops the angle of bank from increasing, because the aileron and rudder control surfaces are in a neutral and streamlined position. Elevator back pressure should be held constant to maintain altitude. The roll-out from a turn is similar to the roll-in, except the flight controls are applied in the opposite direction. The aileron and rudder are applied in the direction of the roll-out or toward the high wing. As the angle of bank decreases, the elevator back pressure should be relaxed as necessary to maintain altitude. The frise-type aileron also forms a slot so air flows smoothly over the lowered aileron, making it more effective at high angles of attack. Frise-type ailerons may also be designed to function differentially. Like the differential aileron, the frise-type aileron does not eliminate adverse yaw entirely. Coordinated rudder application is still needed when ailerons are applied.